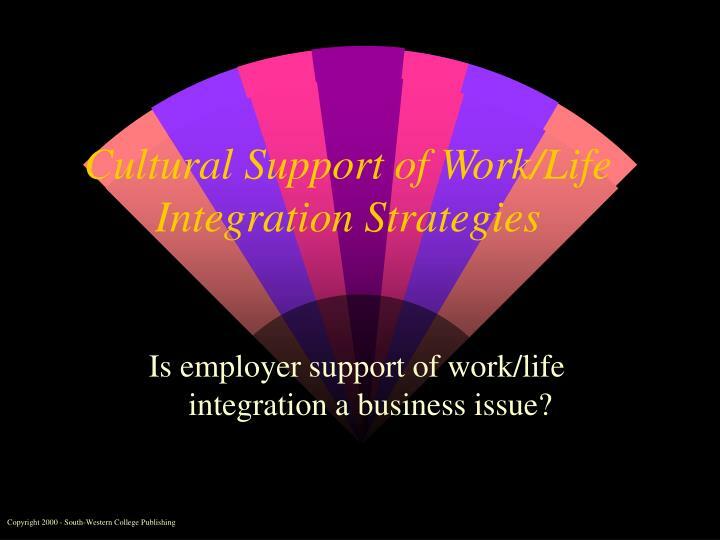 Cultural Support of Work/Life Integration Strategies. Is employer support of work/life integration a business issue?. Ice Breaker:. 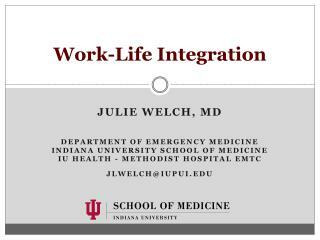 Is support for work/family integration a business issue? Why or why not? Form a pair. 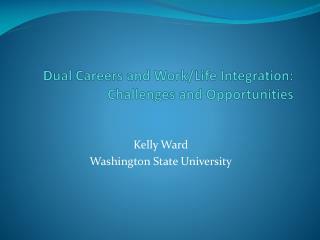 Is employer support of work/life integration a business issue? 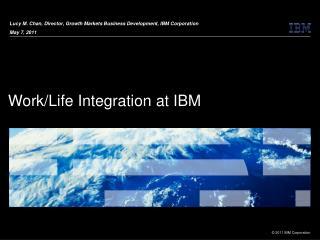 Is support for work/family integration a business issue? Why or why not? 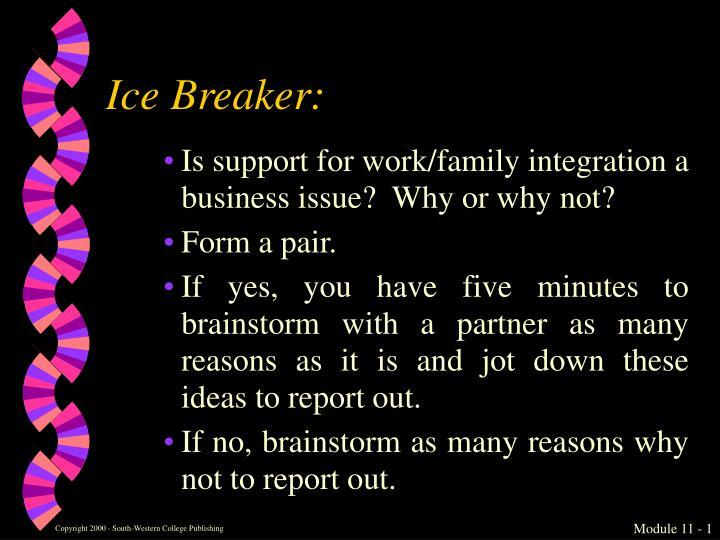 If yes, you have five minutes to brainstorm with a partner as many reasons as it is and jot down these ideas to report out. If no, brainstorm as many reasons why not to report out. 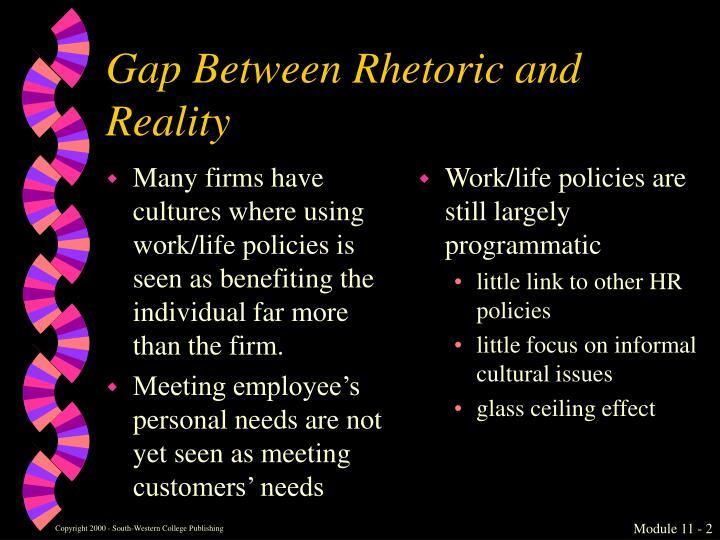 Many firms have cultures where using work/life policies is seen as benefiting the individual far more than the firm. 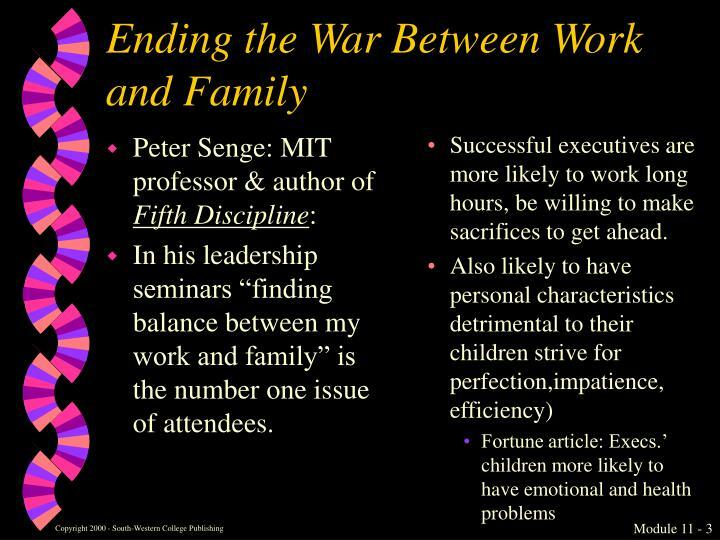 In his leadership seminars “finding balance between my work and family” is the number one issue of attendees. Successful executives are more likely to work long hours, be willing to make sacrifices to get ahead. Either dream about the potential balanced future self; minimize our needs or our families’ needs. 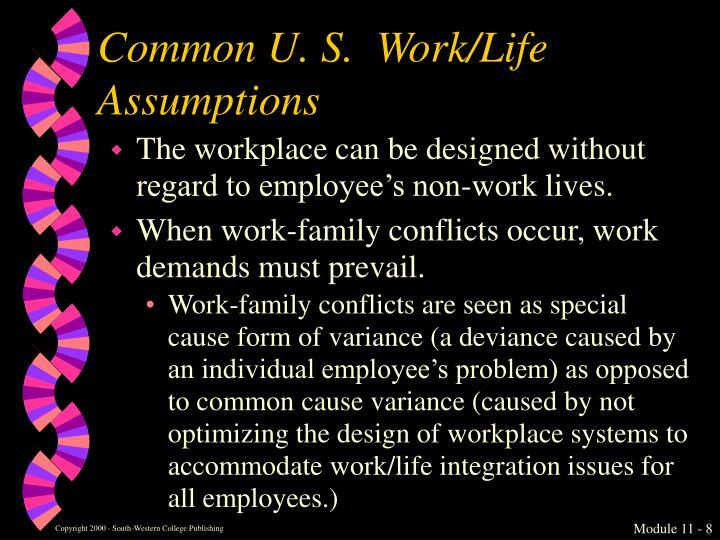 Common U. S. Work/Life Assumptions: Is there a war between work and family? 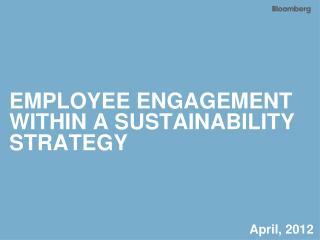 Employees cannot be equally committed to the family and the workplace. The workplace can be designed without regard to employees’ non-work lives. Society as a whole doesn’t necessarily benefit when we help individual with family needs. 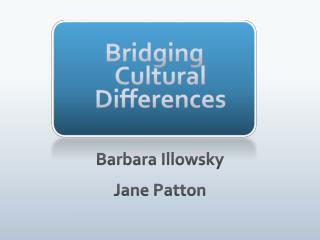 Nuturance activities such as child and elder care are mainly the purview of women. Personal problems should be kept at home. 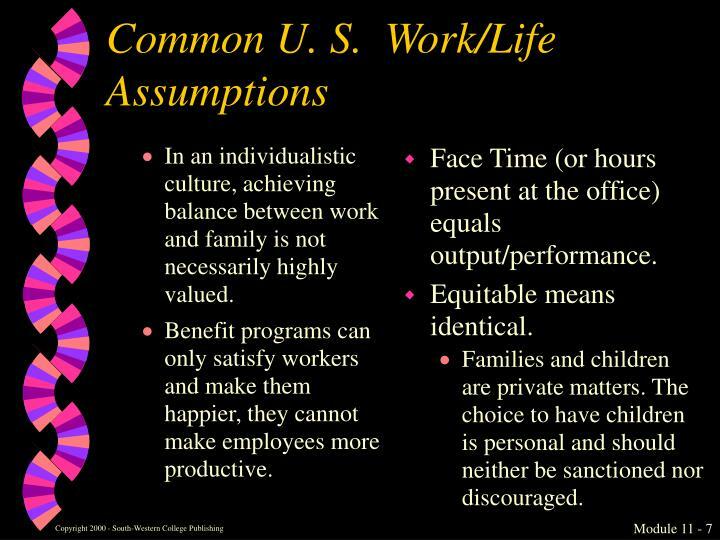 In an individualistic culture, achieving balance between work and family is not necessarily highly valued. 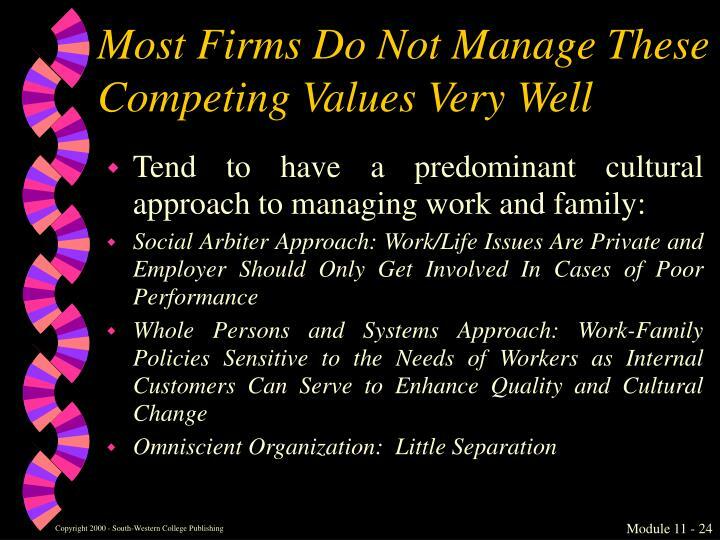 Benefit programs can only satisfy workers and make them happier, they cannot make employees more productive. Face Time (or hours present at the office) equals output/performance. Families and children are private matters. The choice to have children is personal and should neither be sanctioned nor discouraged. 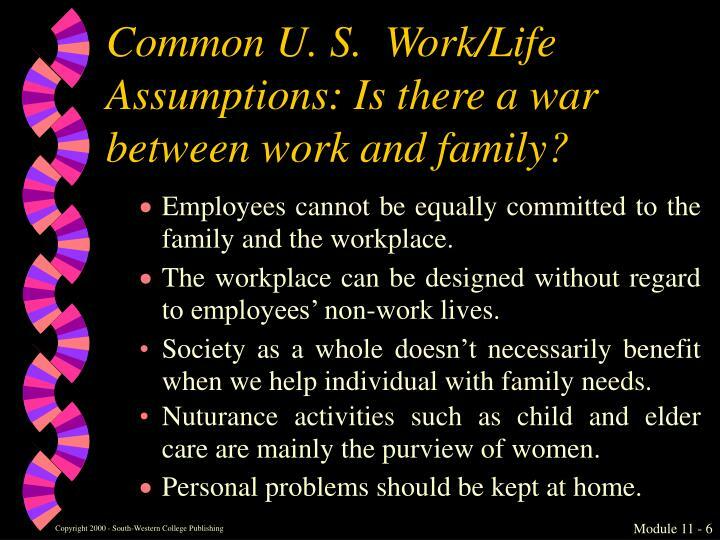 The workplace can be designed without regard to employee’s non-work lives. When work-family conflicts occur, work demands must prevail. 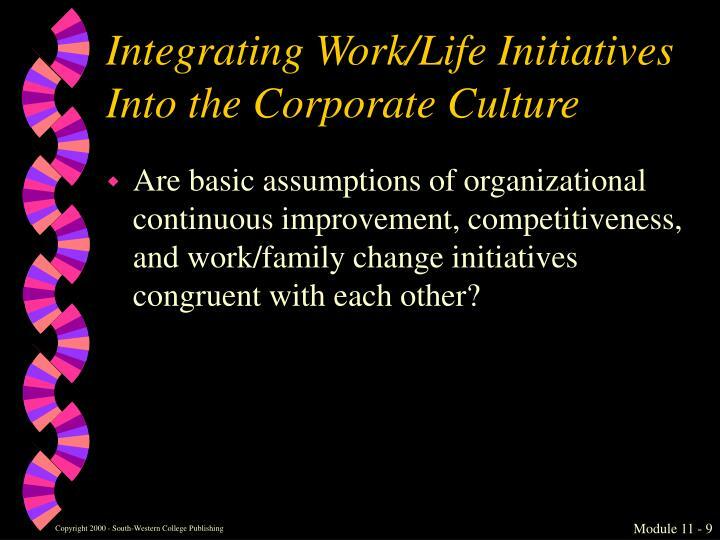 Are basic assumptions of organizational continuous improvement, competitiveness, and work/family change initiatives congruent with each other? Consistently shown to influence key work and personal outcomes ranging from job, life, and family satisfaction to performance to turnover. 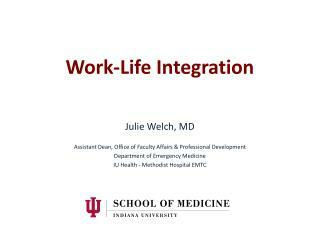 Growing work-life integration pressures on employees also may affect employers’ ability to realize the potential of their future labor force. 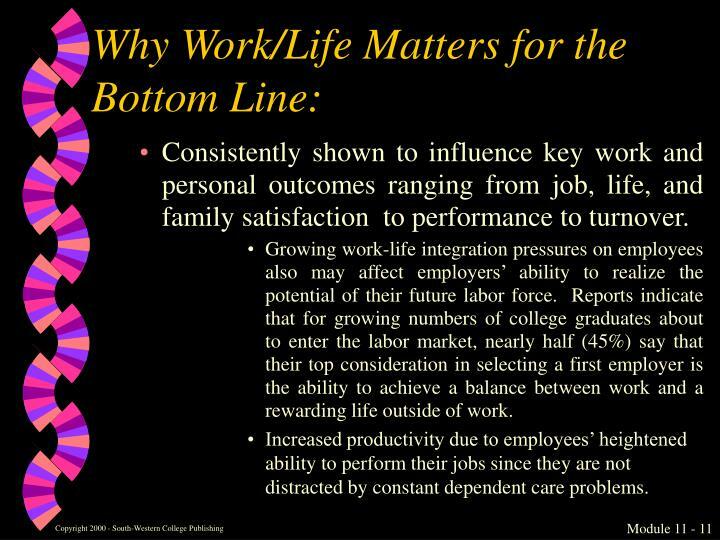 Reports indicate that for growing numbers of college graduates about to enter the labor market, nearly half (45%) say that their top consideration in selecting a first employer is the ability to achieve a balance between work and a rewarding life outside of work. Increased productivity due to employees’ heightened ability to perform their jobs since they are not distracted by constant dependent care problems. Research also shows that family problems can have major financial costs for employers. Data from a national panel study conducted by The University of Michigan’s Institute for Social Research indicates that family and marital problems translate into work loss of approximately $6.8 billion per year. 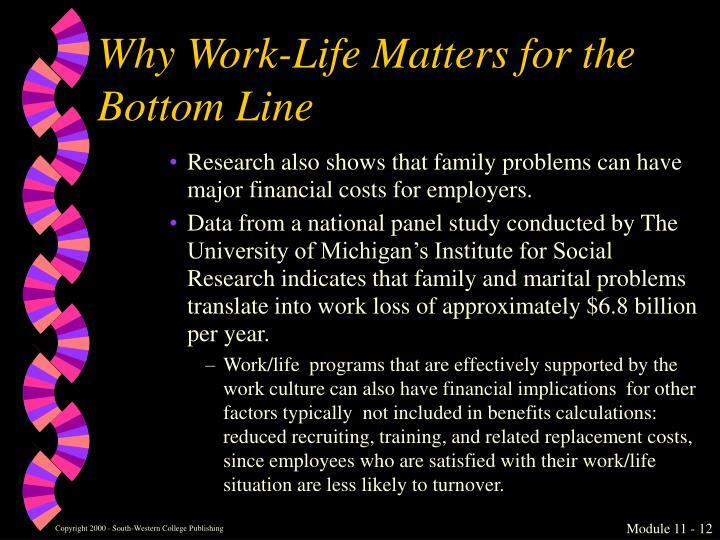 Work/life programs that are effectively supported by the work culture can also have financial implications for other factors typically not included in benefits calculations: reduced recruiting, training, and related replacement costs, since employees who are satisfied with their work/life situation are less likely to turnover. 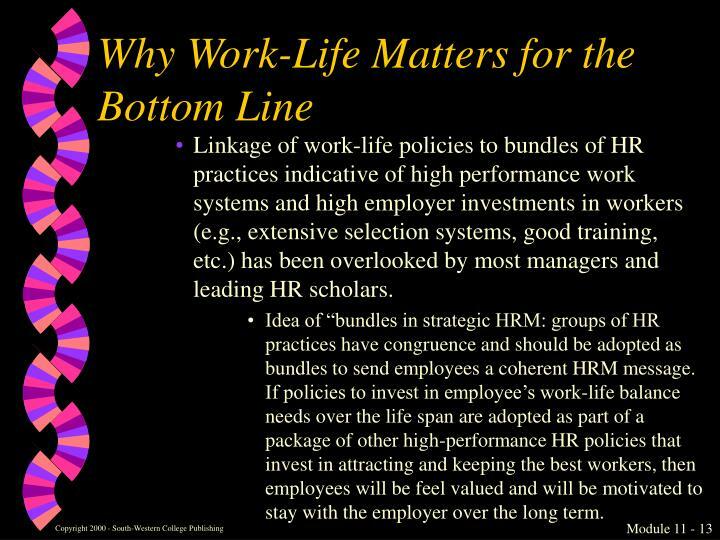 Linkage of work-life policies to bundles of HR practices indicative of high performance work systems and high employer investments in workers (e.g., extensive selection systems, good training, etc.) 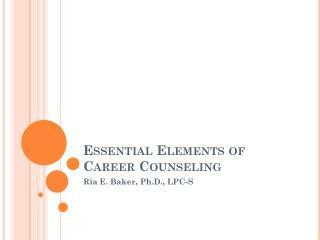 has been overlooked by most managers and leading HR scholars. 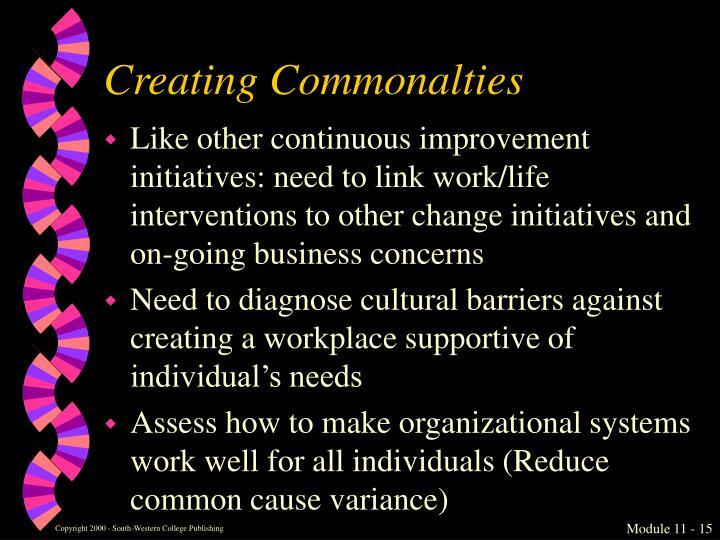 Idea of “bundles in strategic HRM: groups of HR practices have congruence and should be adopted as bundles to send employees a coherent HRM message. 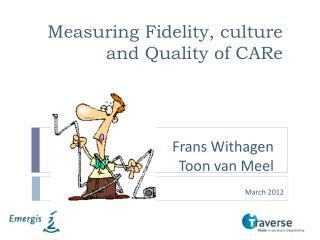 If policies to invest in employee’s work-life balance needs over the life span are adopted as part of a package of other high-performance HR policies that invest in attracting and keeping the best workers, then employees will be feel valued and will be motivated to stay with the employer over the long term. 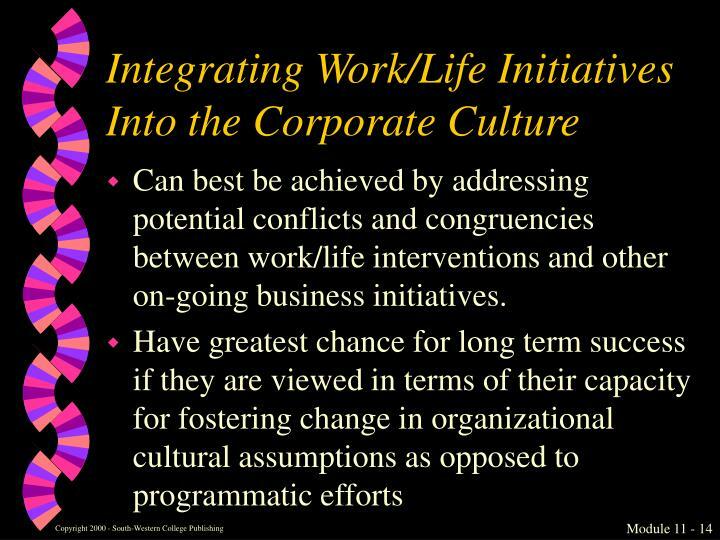 Can best be achieved by addressing potential conflicts and congruencies between work/life interventions and other on-going business initiatives. 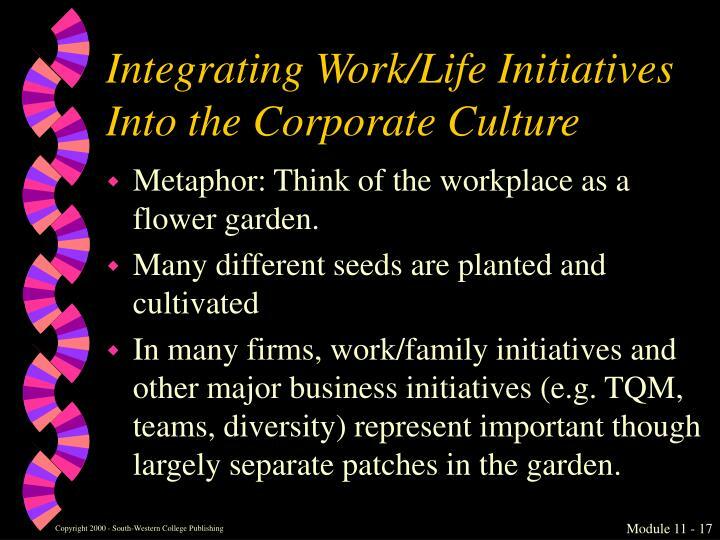 Metaphor: Think of the workplace as a flower garden. 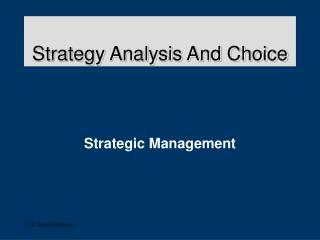 In many firms, work/family initiatives and other major business initiatives (e.g. 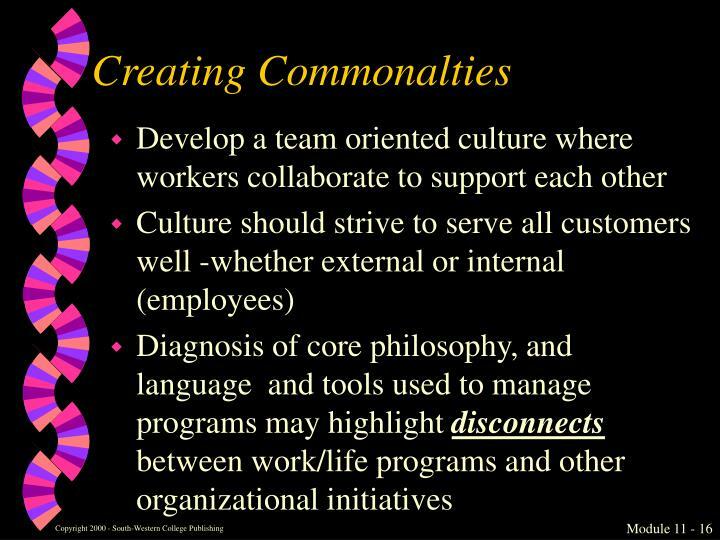 TQM, teams, diversity) represent important though largely separate patches in the garden. 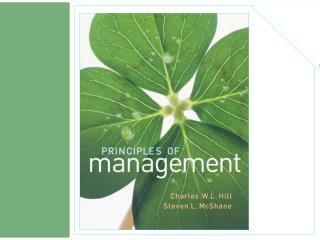 Effective managers must manage competing tensions and paradoxes and offer conflicting messages. 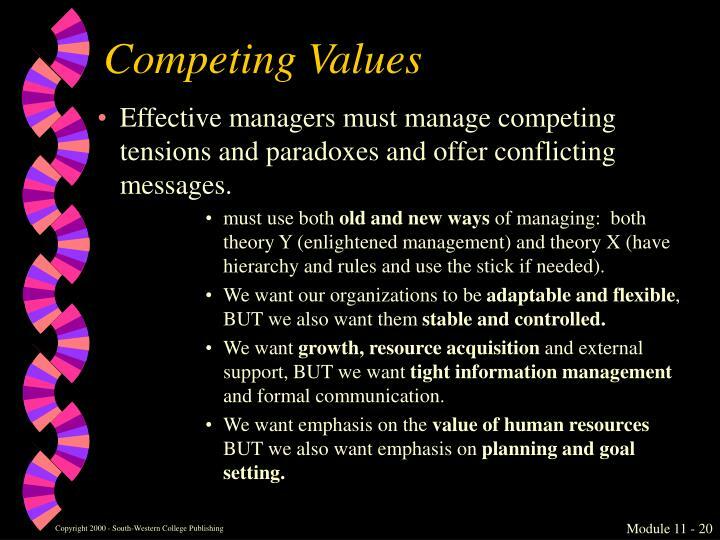 must use both old and new ways of managing: both theory Y (enlightened management) and theory X (have hierarchy and rules and use the stick if needed). 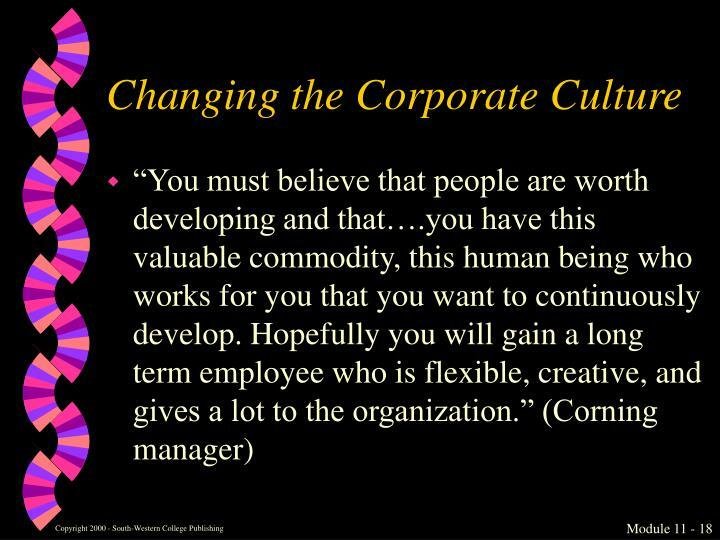 We want our organizations to be adaptable and flexible, BUT we also want them stable and controlled. 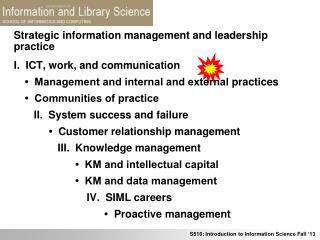 We want growth, resource acquisition and external support, BUT we want tight information management and formal communication. 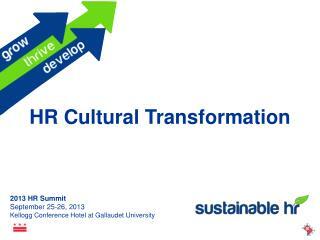 We want emphasis on the value of human resources BUT we also want emphasis on planning and goal setting. 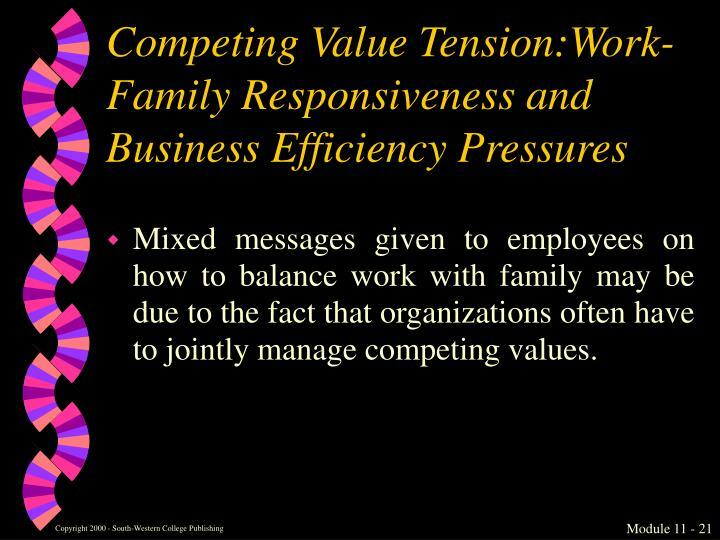 Mixed messages given to employees on how to balance work with family may be due to the fact that organizations often have to jointly manage competing values. 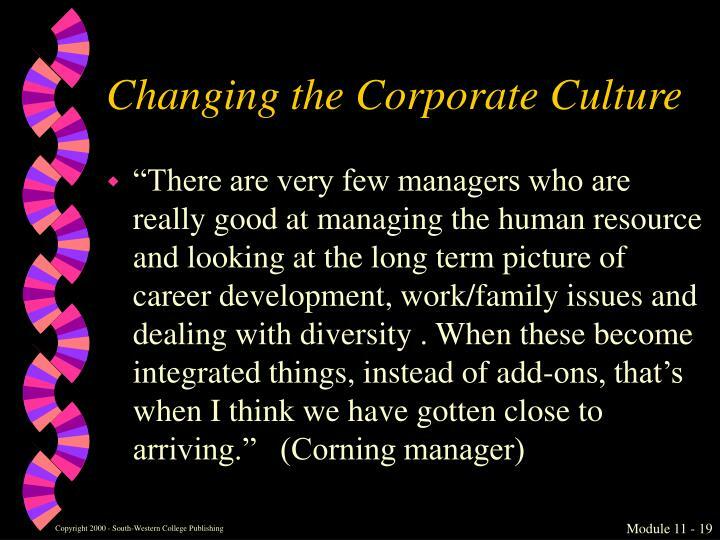 Takes long term view of human resource development that views investment in employees’ work/life integration needs as way to promote productivity through caring about workers . 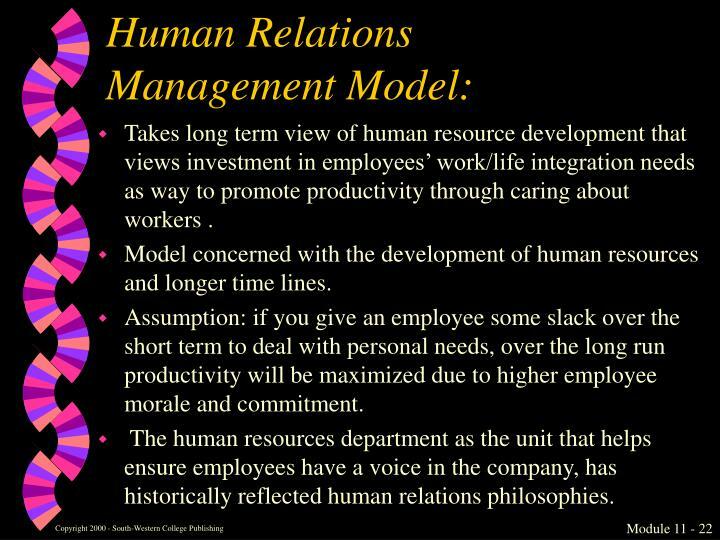 Model concerned with the development of human resources and longer time lines. Assumption: if you give an employee some slack over the short term to deal with personal needs, over the long run productivity will be maximized due to higher employee morale and commitment. 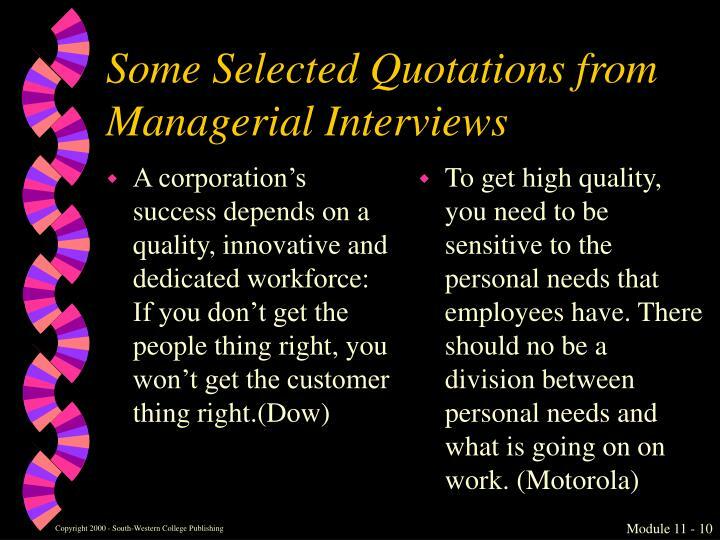 The human resources department as the unit that helps ensure employees have a voice in the company, has historically reflected human relations philosophies. 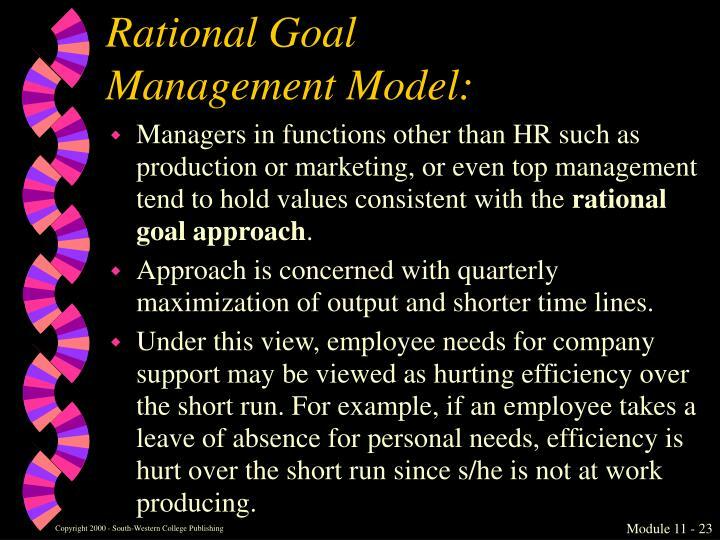 Managers in functions other than HR such as production or marketing, or even top management tend to hold values consistent with the rational goal approach. Approach is concerned with quarterly maximization of output and shorter time lines. Under this view, employee needs for company support may be viewed as hurting efficiency over the short run. For example, if an employee takes a leave of absence for personal needs, efficiency is hurt over the short run since s/he is not at work producing. 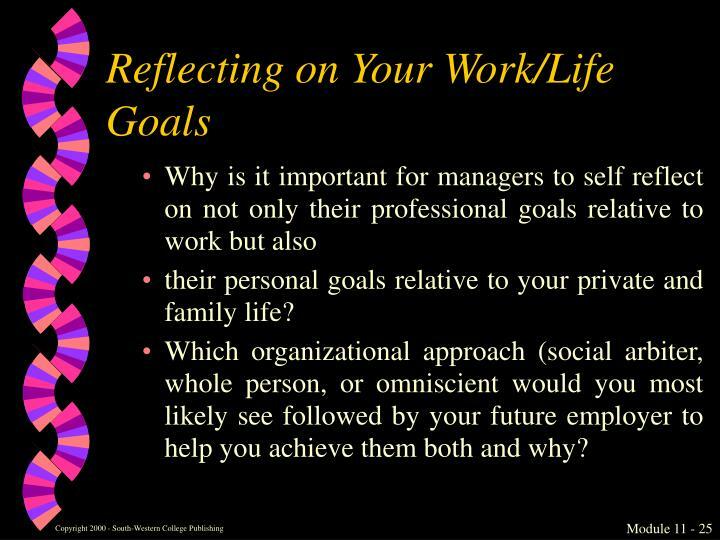 their personal goals relative to your private and family life? 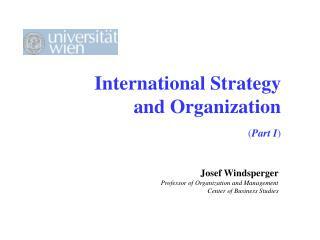 Which organizational approach (social arbiter, whole person, or omniscient would you most likely see followed by your future employer to help you achieve them both and why? Health, Work and Unemployment -. 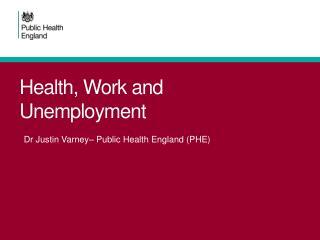 dr justin varney– public health england (phe). 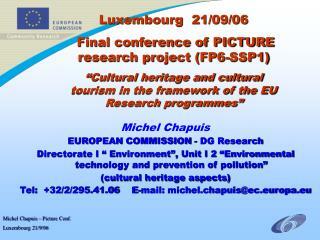 places and people. birth – 5yrs early years. older adults &gt;65yrs. school aged children 5- - 18yrs. young adults to established adults 18 to 64yrs. 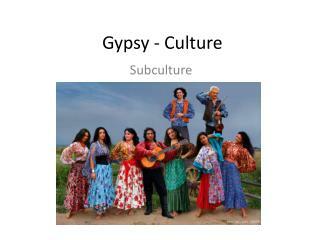 Building a Culture of Philanthropy -. 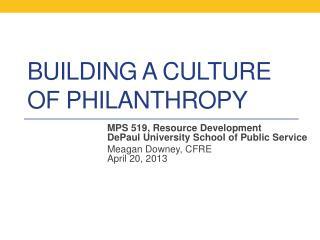 mps 519, resource development depaul university school of public service meagan downey, cfre april 20, 2013.